EADS Astrium selects Arianespace to launch the fourth satellite in the Skynet 5 constellation. Jean-Yves Le Gall, Arianespace Chairman and CEO, announced today the launch contract signing of the Skynet 5D satellite with Astrium. Arianespace had already been chosen by Astrium to launch the Skynet 5A, 5B and 5C satellites. Like the three previous spacecraft in the Skynet 5 family, Skynet 5D will be placed in geostationary transfer orbit by an Ariane 5 launcher from the Guiana Space Center in French Guiana. Launch is scheduled for the first half of 2013. Skynet 5D will be orbited by Arianespace for Astrium, which is contracted to deliver the satellite in orbit to the company Paradigm Secure Communications, a wholly owned subsidiary of Astrium. Astrium’s Secure SatCom Systems is the prime system integrator and system design authority for Skynet 5 and Paradigm offers secure communications services to the British armed forces, NATO, other European countries, the USA and Australia. Built by Astrium using a Eurostar E-3000 LX platform, carrying powerful X-band transponders, Skynet 5D will weigh 4,800 kg. at launch. Previously, Arianespace orbited the Skynet 4B, 4C, 4E and 4F satellites for the British Ministry of Defence. Skynet 5D is the 35th military payload to have chosen an Ariane launch. This latest contract clearly illustrates the strategic facet of Ariane 5, which guarantees independent access to space for all European governments. The Ariane 5 launcher is one of the keys to the development of a common European security policy, since it plays a pivotal role in the indispensable space segment. Since the beginning of the year, Arianespace has signed 7 launch contracts for geostationary satellites and 5 dedicated Soyuz launches. Initial build-up is underway at the Spaceport for Arianespace’s seventh Ariane 5 to be launched from French Guiana this year, initiating preparations to support this mid-December flight with the Skynet 5D and Mexsat 3 telecommunications satellites. Designated Ariane Flight VA211, the mission maintains Arianespace’s sustained launch pace that benefits from designed-in flexibility of the Spaceport’s heavy-lift launcher processing flow. The Flight VA211 vehicle is beginning to take shape inside the Spaceport’s Launcher Assembly Building, while a nearly-completed Ariane 5 for Arianespace’s upcoming Flight VA210 currently is in the Final Assembly Building, ready to receive its EUTELSAT 21B and Star One C3 passengers for a November liftoff. Flight VA211’s Skynet 5D passenger will ride in Ariane 5’s upper payload slot for deployment first during the mission, while Mexsat 3 is to be installed as the launcher’s lower passenger. Skynet 5D was built by the Astrium division of EADS and is based on a high-power E3000 variant of the company’s Eurostar series. It will weigh approximately 5,000 kg. at launch and carry X-band transponders to provide secure voice and data communications for military operations in peacekeeping and battlefield conditions. Users of the Skynet system include the British armed forces, other European countries’ militaries, NATO nations and Australia. The Mexsat 3 passenger for Arianespace Flight VA211 is produced by U.S. satellite manufacturer Orbital Sciences Corporation, and will have a liftoff mass of nearly 3,050 kg. with its complement of extended C-band and Ku-band transponders. The satellite will provide next-generation communications services throughout Mexico and its surrounding waters, with a design in-orbit lifetime of more than 15 years. In parallel, a key milestone was reached for Arianespace’s Flight VA211 with the completion of initial build-up for its Ariane 5, which has been assembled inside the Spaceport’s Launcher Integration Building. This step was marked with installation of the ESC-A upper stage and vehicle equipment bay as a single unit atop the vehicle’s cryogenic core stage. Once additional integration and checkout steps are completed, the Ariane 5 will be ready for its transfer from the Launcher Integration Building to the Spaceport’s Final Assembly Building – currently occupied by Flight VA210’s Ariane 5. The Final Assembly Building will become available once the Ariane 5 for Flight VA210 is transferred from this facility to the Spaceport’s ELA-3 launch zone on the day before liftoff. Arianespace’s Flight VA211 is targeted for mid-December with a dual-payload of the Skynet 5D and Mexsat 3 satellites. Preparations for these two upcoming launches continue a busy year for Arianespace’s heavy-lift Ariane 5. Previous missions during 2012 lofted Europe’s third Automated Transfer Vehicle for servicing of the International Space Station on March 23; the JCSAT-13 and VINASAT-2 telecommunications spacecraft on May 15; a mixed telecommunications/meteorological satellite payload of EchoStar XVII and MSG-3 on July 5; the Intelsat 20 and HYLAS 2 relay platforms on August 2; and the ASTRA 2F and GSAT-10 spacecraft on September 28. The second passenger for Arianespace’s next heavy-lift Ariane 5 mission – Mexsat Bicentenario – has arrived in French Guiana. Built by satellite manufacturer Orbital Sciences Corporation, this telecommunications satellite will have an estimated liftoff mass of 2.900 kg. It is based on Orbital’s GEOStar-2 spacecraft platform and will generate approximately 3.5 kilowatts of payload power, carrying 12 active extended Ku-band and 12 active extended C-band transponders. Mexsat Bicentenario will provide communications services to Mexico and its surrounding waters from the 114.9 deg. West Longitude orbital slot, with a design mission lifetime of 15 years. Orbital was selected by Boeing to provide the Fixed Satellite Services (FSS) segment of the Mexsat satellite system for the Federal Government of Mexico, with this contribution consisting of the Mexsat Bicentenario spacecraft and the FSS ground segment – including the satellite command and control ground equipment and software, as well as training and operational documentation. Mexsat Bicentenario was delivered to French Guiana’s Félix Eboué Airport this week aboard a chartered Boeing 747 cargo aircraft, and is joining the Skynet 5D military communications satellite that recently arrived in French Guiana for its pre-launch checkout at the Spaceport. Skynet 5D and Mexsat Bicentenario will be orbited on December 19 by an Ariane 5, marking Arianespace’s seventh mission in 2012 with this heavy-lift workhorse launcher. The year-ending Ariane 5 flight is designated VA211 in the Arianespace mission numbering system, designating the 211th Ariane mission since the family of European-built launch vehicles entered service in 1979. DULLES, Va., Nov. 26, 2012 -- Boeing [NYSE: BA] and partner Orbital Sciences Corporation [NYSE: ORB] are a step closer to helping the government of Mexico provide advanced communications services throughout the country and surrounding maritime area with the completion of the MEXSAT Bicentenario communications satellite. Orbital designed, manufactured and tested MEXSAT Bicentenario before shipping the completed spacecraft to Kourou, French Guiana, where it is scheduled to be launched aboard an Ariane 5 rocket on Dec. 19. Under a contract with Boeing, Orbital completed the work on MEXSAT Bicentenario as part of a three-satellite order for the Federal Government of Mexico. As prime contractor for MEXSAT, Boeing is providing two larger satellites in the series that are scheduled for launch in 2013 and 2014. The Secretaria de Comunicaciones y Transportes of Mexico will take over day-to-day operations of the satellites as they are launched and undergo on-orbit testing, verification and positioning. "MEXSAT Bicentenario is based on Orbital’s flight-proven GEOStar-2 platform, which enabled us to deliver the spacecraft on a short delivery schedule," said Christopher Richmond, Orbital senior vice president of Communications Satellite Programs. "We are looking forward to a successful launch and a smooth on-orbit checkout sequence." Boeing Space & Intelligence Systems is the overall integrator of the MEXSAT communications network, which will comprise three satellites, two ground telemetry and control sites, associated network operations systems, and reference user terminals. The second and third MEXSAT satellites will be Boeing 702HP geomobile satellites that will each supply 14 kilowatts of power and carry a 22-meter L-band reflector for mobile satellite services. Orbital develops and manufactures small- and medium-class rockets and space systems for commercial, military and civil government customers. The company's primary products are satellites and launch vehicles, including low Earth orbit, geosynchronous Earth orbit and planetary exploration spacecraft for communications, remote sensing, scientific and defense missions; human-rated space systems for Earth orbit, lunar and other missions; ground- and air-launched rockets that deliver satellites into orbit; and missile defense systems that are used as interceptor and target vehicles. Orbital also provides satellite subsystems and space-related technical services to U.S. government agencies and laboratories. More information about Orbital can be found at www.orbital.com. The Spaceport is once again handling parallel campaigns with two different members of the Arianespace launcher family, as a heavy-lift Ariane 5 has moved to the Final Assembly Building to be readied for its December 19 flight, while a medium-lift Soyuz is now complete at a separate complex in French Guiana for a nighttime launch this Friday. Arianespace’s mission with Ariane 5 is to orbit the Mexsat Bicentenario telecommunications satellite for Mexico and the European Skynet 5D military relay platform. The launch is designated Flight VA211 in the company’s numbering system, signifying the upcoming 211th liftoff of an Ariane family vehicle from the Spaceport. With the transfer of Flight VA211’s Ariane 5 to the Final Assembly Building within the Spaceport’s ELA-3 launch complex today, it will be ready to receive the dual payload for Arianespace’s seventh flight with the heavy-lift workhorse vehicle in 2012. In separate activity across the Spaceport in its northwestern sector, the Soyuz for Arianespace’s next medium-lift mission has been equipped with its Pléiades 1B observation satellite passenger at the ELS launch complex. This is Flight VS04, notating Soyuz’ fourth mission at the Spaceport since it entered service at the facility in October 2011 – and the second liftoff in 2012 of the Russian-built vehicle from French Guiana. The seventh Ariane 5 for liftoff in 2012 from French Guiana has begun its final payload integration process at the Spaceport , marking a new preparatory step for this December 19 mission with the Mexsat Bicentenario and Skynet 5D satellites. During activity in the Spaceport’s Final Assembly Building, Mexsat Bicentenario was positioned atop Ariane 5’s core section – becoming the lower passenger in the launcher’s payload “stack.” It will be deployed after the separation of Skynet 5D, which will ride as the Ariane 5’s upper passenger. Mexsat Bicentenario is based on Orbital Sciences Corporation’s GEOStar-2 spacecraft platform, and has been designed to generate approximately 3.5 kilowatts of payload power for 12 active extended Ku-band and 12 active extended C-band transponders. Liftoff mass of the telecommunications satellite is approximately 2,900 kg. The Skynet 5D satellite has joined its Mexsat Bicentenario co-passenger on Ariane 5, marking a new milestone in preparations for Arianespace’s seventh and final heavy-lift flight of 2012 from the Spaceport in French Guiana – scheduled for December 19. Encapsulated in an ogive-shaped payload fairing, Skynet 5D was lowered into place on Tuesday over Mexsat Bicentenario – which had been installed atop Ariane 5’s cryogenic core stage during activity the previous day inside the Spaceport’s launch vehicle Final Assembly Building. Skynet 5D is riding as the upper passenger in Ariane 5’s payload “stack,” to be deployed first in the launch sequence. This is the fourth satellite in the Skynet 5 series built by Astrium, which is the prime contractor for the British military satellite program – operated as a Private Finance Initiative with the United Kingdom’s Ministry of Defence. The Astrium Services business of Astrium operates the Skynet military satellite constellation and the ground network for all beyond-line-of-sight communications to the U.K. Ministry of Defence and the Cabinet Office. Astrium Services also provides Skynet-based communication services to other forces around the world, including the United States, Portugal and Australia. The Skynet 5D relay platform is expected to reinforce and extend the operational services provided by the three Skynet 5 satellites already in orbit. It will be located over the Middle East – at a 53 deg. East orbital slot. The first three Skynet 5 satellites also were launched by Arianespace on Ariane 5 vehicles. Larger fuel tanks on this latest Skynet spacecraft will enable it to be repositioned more frequently to meet operational needs. Skynet 5D will extend the total commercially-owned X-band (Super High Frequency) to over 2 GHz of high powered beams across the globe. To provide additional UHF capacity on Skynet 5D for military and government customers worldwide, Astrium Services earlier this year signed a multi-million dollar contract with Harris CapRock. The Mexsat Bicentenario passenger to be launched December 19 with Skynet 5D on Ariane 5 is based on Orbital Sciences Corporation’s GEOStar-2 spacecraft platform. It will provide communications services to Mexico and its surrounding waters from the 114.9 deg. West Longitude orbital slot and has a design mission lifetime of 15 years. Orbital was selected by Boeing to provide the Fixed Satellite Services (FSS) segment of the Mexsat satellite system for the Federal Government of Mexico, with this contribution consisting of the Mexsat Bicentenario spacecraft and the FSS ground segment – including satellite command and control ground equipment and software, as well as training and operational documentation. The year-ending Ariane 5 mission with Mexsat Bicentenario and Skynet 5D is designated Flight VA211 in Arianespace’s numbering system, signifying the 211th liftoff for an Ariane family vehicle from the Spaceport. Arianespace’s seventh and final Ariane 5 launch of 2012 has received its “green light” for liftoff with today’s successful launch readiness review performed at the Spaceport in French Guiana. The review is held prior to each Ariane 5 mission, ensuring that the heavy-lift launch vehicle and its payload are flight-ready, along with the Spaceport’s infrastructure and the network of downrange tracking stations. This approval clears the way for Ariane 5’s rollout tomorrow from the Final Assembly Building to Ariane Launch Complex No. 3 at the Spaceport – positioning it for liftoff on Wednesday, December 19 during a launch window that opens at 6:49 p.m. and continues to 8:08 p.m., local time in French Guiana. This flight will orbit a dual-passenger payload of the Mexsat Bicentenario telecommunications satellite for the Mexican Secretariat of Communications and Transport, along with the Skynet 5D secure military communications relay platform for the European operator Astrium Services, on behalf of the British Ministry of Defence. Skynet 5D was built by Astrium Satellites of Stevenage, England, and will be the 38th military payload lofted by the Ariane launcher family. Weighing approximately 4,800 kg. at launch and based on the Eurostar E3000 platform, it has an expected lifetime of 15 years and will be the 89th Astrium satellite launched by Arianespace. The spacecraft has a design lifetime of 16 years and weighs an estimated 2,935 kg. for liftoff. It will be positioned in geostationary orbit at 114.9 deg. West to provide communication services to Mexico and its surrounding waters. Mexsat Bicentenario was built by the Virginia, U.S.-based Orbital Sciences Corporation, based on its GEOStar-2 platform. This will be fifth Mexican satellite launched by Ariane and the 23rd Orbital-built satellite to be transported by Arianespace. The spacecraft has a design lifetime of 16 years and weighs about 3,000 kg. for liftoff. It will be positioned in geostationary orbit at 114.9 deg. West to provide communication services to Mexico and its surrounding waters. This year-ending Ariane 5 mission is designated VA211 in Arianespace’s flight numbering system, designating the 211th Ariane family liftoff from the Spaceport in French Guiana. Its total payload performance is approximately 8,635 kg. – which includes the two satellite passengers and their integration hardware for Ariane 5’s dual-payload deployment system. The seventh – and final – Ariane 5 mission of 2012 is ready for its December 19 liftoff as the vehicle for this dual-payload Arianespace flight is now in the Spaceport’s launch zone at French Guiana. Carrying the Skynet 5D secure military relay platform and Mexsat Bicentenario telecommunications satellite, the mission will bring a busy 12 months to a close – during which Arianespace already has performed six heavy-lift Ariane 5 flights and two medium-lift Soyuz launches from French Guiana, along with its support for the lightweight Vega’s debut at the Spaceport. In addition, the company’s Starsem affiliate launched one Soyuz from Baikonur Cosmodrome in Kazakhstan. For Arianespace’s year-ending mission, its Ariane 5 rolled out today from the Spaceport’s Final Assembly Building to Ariane Launch Complex No. 3, where it is scheduled for a December 19 liftoff. The launch window opens at 6:49 p.m. and continues to 8:08 p.m., local time in French Guiana. Skynet 5D will be released first during the mission, deployed at 27 minutes after liftoff from the upper passenger position in Ariane 5’s payload “stack.” It will be followed by Mexsat Bicentenario’s separation nine minutes later. This is the 211th mission of an Ariane family launcher, and will be the 67th Ariane 5 launch to date. The flight’s total payload lift performance is an estimated 8,635 kg., which includes approximately 7,735 kg. for the two satellite passengers. What? Wanna turn it into a LIVE-thread already? Jonathan Amos gives a video overview of the Skynet-5D spacecraft. Arianespace has begun the final countdown for this evening’s Ariane 5 mission from the Spaceport, which is to orbit a dual-passenger payload consisting of the Skynet 5D and Mexsat Bicentenario satellites. 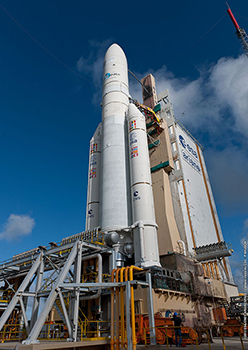 Liftoff is planned during a one-hour, 19-minute launch window that opens at 6:49 p.m. local time in French Guiana, initiating this seventh – and final – flight of 2012 with Arianespace’s workhorse heavy-lift launcher. Skynet 5D will be deployed first in the flight sequence, with its release scheduled at 27 minutes into the mission – to be followed Mexsat Bicentenario’s separation from the Ariane 5 nine minutes later. Weighing approximately 4,800 kg. at launch, Skynet 5D is the fourth satellite in the Skynet 5 series built by Astrium, which is the prime contractor for the British military satellite program – operated as a Private Finance Initiative with the United Kingdom’s Ministry of Defence. The spacecraft is expected to reinforce and extend the operational services provided by the three Skynet 5 satellites already in orbit, and will be located over the Middle East – at a 53 deg. East orbital slot. Following its deployment by Ariane 5, Mexsat Bicentenario – which is based on Orbital Sciences Corporation’s GEOStar-2 platform – will provide communications services to Mexico and its surrounding waters from the 114.9 deg. West Longitude orbital slot. It weighs an estimated 2,935 kg. for liftoff. Less than 1/2 hour to transmission. Weather seems to be fine for launch - all the nasty rain showers are either out over the Atlantic or located further inland.